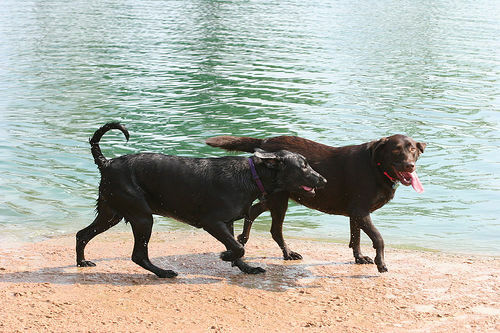 Houston, Texas, has some of the best dog parks in the country within its surrounding premises. Since Houston is a hot place, many of the parks come with running water for both dogs and humans, as well as shaded areas for your comfort. Make sure you read the dog park rules before you head to them. This popular park is located in West Houston, and is over 20 acres. It is double-gated and fenced, and open every day dawn to dusk. There is a separate area for big and small dogs, each with its own playing features. It has available dog waste bags, water fountains, dog showers, benches, many trees, long walking trails, shaded areas and its own parking lot. Perfect! This nice park is located in West Houston, and is thirteen acres. It is double-gated and fenced, and is open every day dusk to dawn. There are restrooms close to the park but not directly in it. There is a separate area for big and small dogs, with large and small fire hydrants in them! It has available dog waste bags, water fountains, dog showers, shaded areas, benches, some trees, a walking path and a parking lot. This park is located in East Houston, and is a large next park with a human park next to it. It is triple gated and fenced, and has separate big and small dog areas. Open dawn to dusk. It comes with dog waste bags, water fountains, dog shower, large trees with plenty of shade area, benches, and information kiosk, portable restroom and information desk. There is a small parking lot. This park comes with separate big and small dog areas, as well as ponds, new trees, benches and a walking path. This is a new park of five acres. It has new trees, a walking path, covered awnings, waste bags, human and dog water fountains and benches. There is a separate area for large and small dogs, and the large dog park has agility equipment. If you want to go for a walk, there is connection to wooded trails and you can walk with your dog on a leash. This is a new park of over five acres. It has separate large and small dog areas. It also has a walking path, dog and human water fountains, waste bags, dog shower stations and picnic tables. It is very shady, which is useful for the hot climate.